Travis Pastrana is a professional Motocross, Supercross, Freestyle Motocross and Stunt Performer. 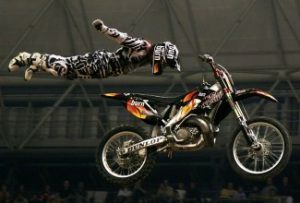 He is most known for his Nitro Circus shows and is quite possibly the most famous dirt bike rider ever. Between Travis Pastrana and Robbie Maddison, they have totally dominated the Freestyle Motocross and Stunt riding arenas. Travis is the only child of Robert and Debby Pastrana. His Dad is a native Puerto Rican, and an ex-Marine. They got him his first bike, a Honda at 4 years of age, noticed his ability early on and encouraged him in racing. At 13 he was performing stunts at motocross events which lead on to his freestyle career. He may be crazy, but he isn’t dumb. He was a brilliant student and graduated from Maryland University with a 4.0 point average. In 1998 he won the World Freestyle Championship when he was only 14. In 1999 he won gold in the first-ever X Games MotoX Freestyle event. By 16 he turned professional. He has always remained loyal to Suzuki and always carries the number 199. -2000 AMA 125cc National Championships. -2001 125cc East Coast Supercross Championships & 125cc Rose Creek Invitational. He has also raced in the Motocross Des Nations. This is where Travis has really made a name for himself. He has nine X-Games gold medals to his credit and has been responsible for making the Backflip an FMX must have. In 2006 At the X Games, he pulled off the world’s first Double backflip in competition. 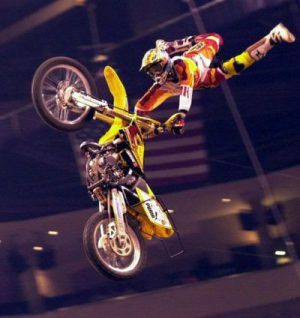 He has become a household name with the success of the MTV show Nitro Circus. -1999 Wins the first ever MotoX Freestyle event at the X Games. -2000 Wins Gold for the second time but breaks his foot after attempting the first ever backflip on a motorcycle. -2001 Wins his third Gold medal. -2003 Wins his fourth Gold Medal. -2004 Wins a Silver medal after crashing while attempting a 50 ft 360 jump, sustaining a concussion. –2005 Wins his fifth Gold medal. -2006 Becomes the third athlete ever to win three golds at a single X Games event. -2007 Took a Bronze medal in Rallying. -2010 Lands another Double Backflip, the first one done at an X Games event. -Dislocated spine, torn ACL, PCL, LCL, MCL and Meniscus in the left knee. -Surgeries on left wrist twice, left thumb once, back surgery twice, right elbow once, left knee nine times, right knee six times, one shoulder surgery. When he was only 14 he was severely injured in an FMX event. He came up short on a jump and separated his spine from his pelvis. He spent 3 months in a wheelchair. He was in and out of consciousness for 3 days and had six blood transfusions. Travis says according to doctors, only three people in the U.S. have survived after such an injury. While in the hospital he would pull wheelies in his wheelchair around the wards. Travis says he can’t even remember all of his injuries. At Travis’ house, he has built his own Motocross track, Supercross track, Freestyle Park, Indoor BMX Park, and has a collection of about 50 motorcycles in his garage. Talk about the ultimate Man-Cave! In 2007 Travis jumped out of an airplane with no parachute! He met up in mid-air with another jumper and latched into the harness to make a tandem landing. Travis has four American Rally titles to his name, driving a Subaru. Travis has also been involved in Monster Trucks and NASCAR racing. Travis remains one of the most marketable athletes in the world today. 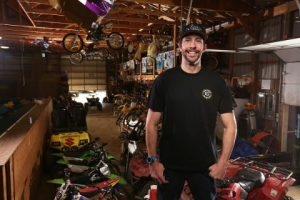 The documentary ‘199 Lives: The Travis Pastrana Story‘ is a must-see movie that attempts to give us an insight into what drives him, through interviews with family, friends, and competitors. Friends of Travis say he is always out to have a good time, even if it kills him. He loves to push himself beyond his own limits. Let’s hope he is around for many more years to come. He’s very lucky to still be here now! Have you ever seen any of Travis’ shows? If there’s another famous rider you’d like to see a Bio on please leave me a comment below. This guy is nuts, but what a personality! It is amazing that he can still stand up. I really like seeing interviews with him, as he has so much energy. I think the maddest thing he did, was sky dive with nothing but a can of Red Bull. He shared a parachute with one of his friends on the way down. Hi Tom, thanks for your comments. Yes he sure lives life on the edge, even if it kills him, as he says. He is an amazing guy, it was fun researching his achievements for the Bio.